Get your game on! The Serengeti Migration Camp is located at the northern edge of the Serengeti, the starting point for the famous annual migration of the wildebeests. 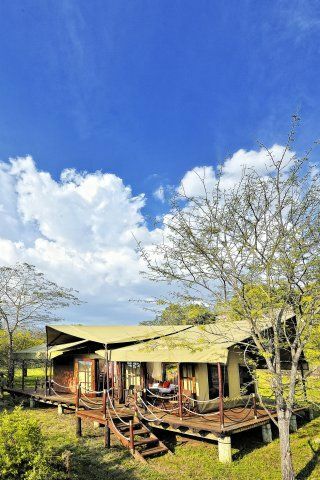 Accommodations consist of 20 elevated canvas tents with hardwood floors, luxurious furnishings, en-suite bathrooms with hot and cold running water, and your own private, wrap-around deck with a 180º view of the Serengeti. Game packages include accommodations, all meals and drinks, laundry, and daily game-drives with experienced guides to take you through Tanzania’s oldest and most popular national park known for its exceptional game viewing: lion prides, great herds of buffalo, elephant and giraffe, and thousands upon thousands of eland, topi, kongoni, impala and Grant’s gazelle. A safari-loving TrailblazerGirl’s dream!